Fiber Fusion Plus is pretty amazing. I always have go to the bathroom the days I take these! They work like a charm! Quick, thorough, gentle results. Will be continuing to use Fiber Fusion Plus by Enzymatic Therapy as part of my recovery program due to poor thyroid condition. Thyroid headaches are gone so I know the detoxification is supporting my thyroid health. 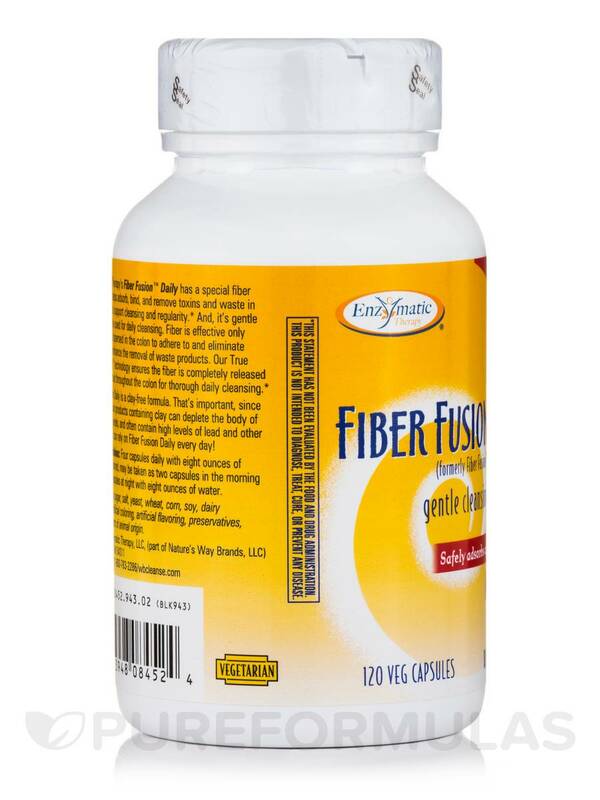 Fiber Fusion Plus is a dietary supplement by Enzymatic Therapy that can possibly help promote healthy‚ normal functioning of the colon. This Enzymatic Therapy formula could be ideal for those looking to improve their overall digestive health. Glucomannan is believed to work in the digestive tract by absorbing water to create large amounts of fiber—which may possibly help regulate bowel movements to prevent the occurrence of constipation. To help promote potential weight loss‚ oat bran is present. Guar gum is a fiber from the seed of the guar plant and it’s believed to help soften body waste. 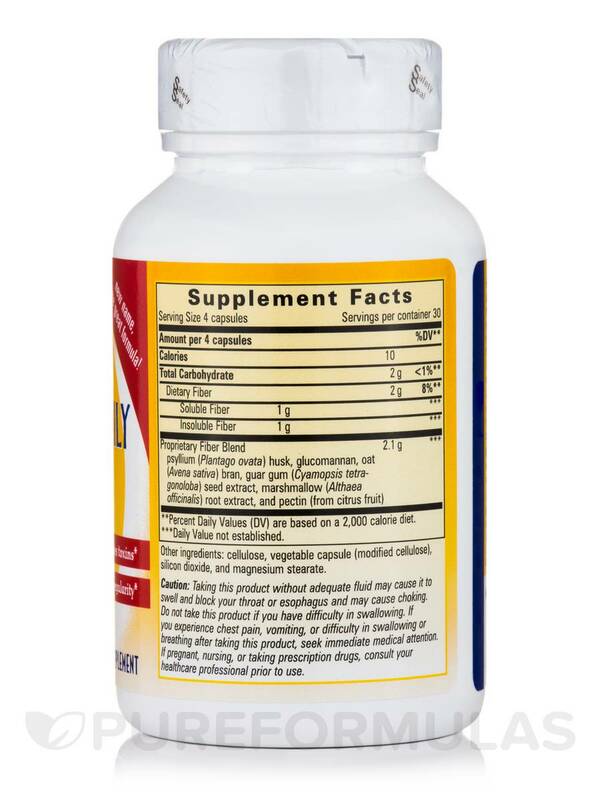 Marshmallow root extract has the potential ability to form a protective layer in the lining of the digestive tract. It may possibly also improve digestion. Before taking Enzymatic Therapy’s Fiber Fusion Plus‚ please consult with your physician to see if this product is right for you. Psyllium (plantago ovata) husk‚ glucomannan‚ oat (avena sativa) bran‚ guar gum (cyamopsis tetragonoloba) seed extract‚ marshmallow (althea officinalis) root extract‚ and pectin (from citrus fruit). 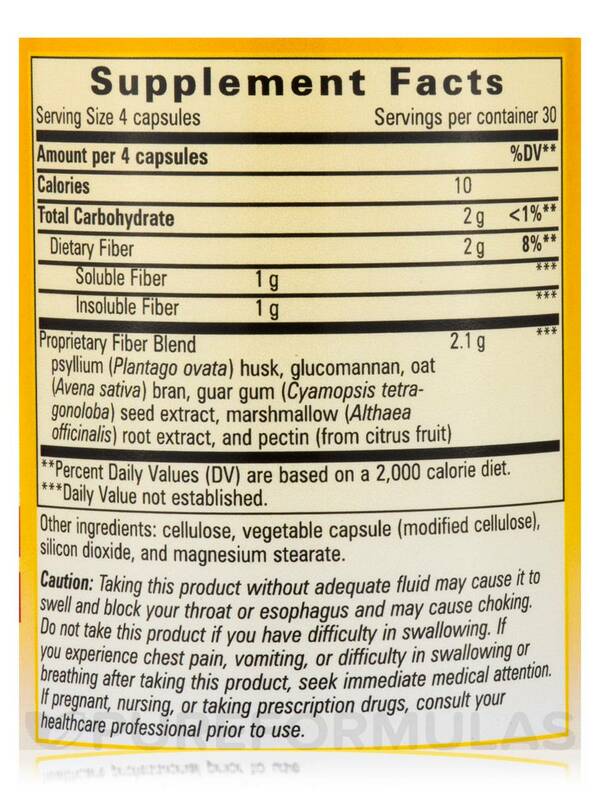 Other Ingredients: Cellulose‚ vegetable capsule (modified cellulose)‚ silicon dioxide‚ and magnesium stearate. 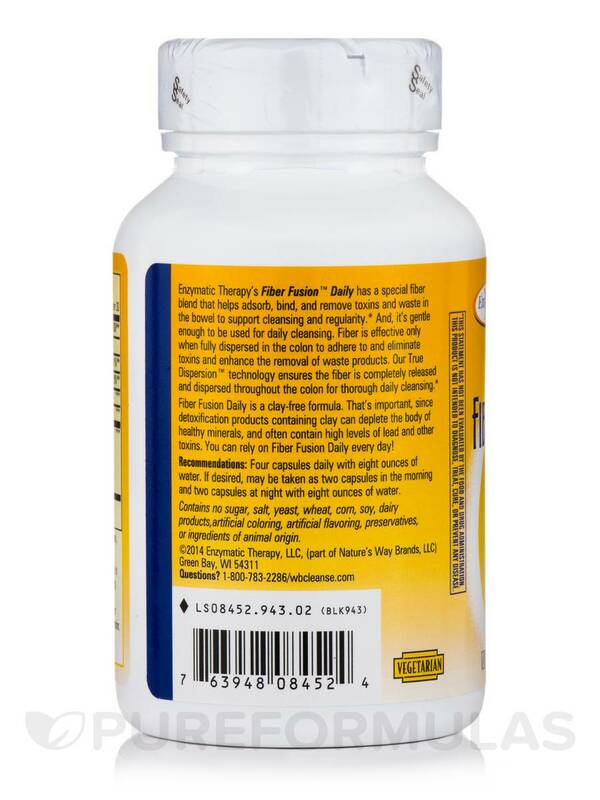 Four capsules daily with eight ounces of water. If desired‚ may be taken as two capsules in the morning and two capsules at night with eight ounces of water. If you experience chest pain‚ vomiting‚ or difficulty in swallowing or breathing after taking this product‚ seek immediate medical attention. 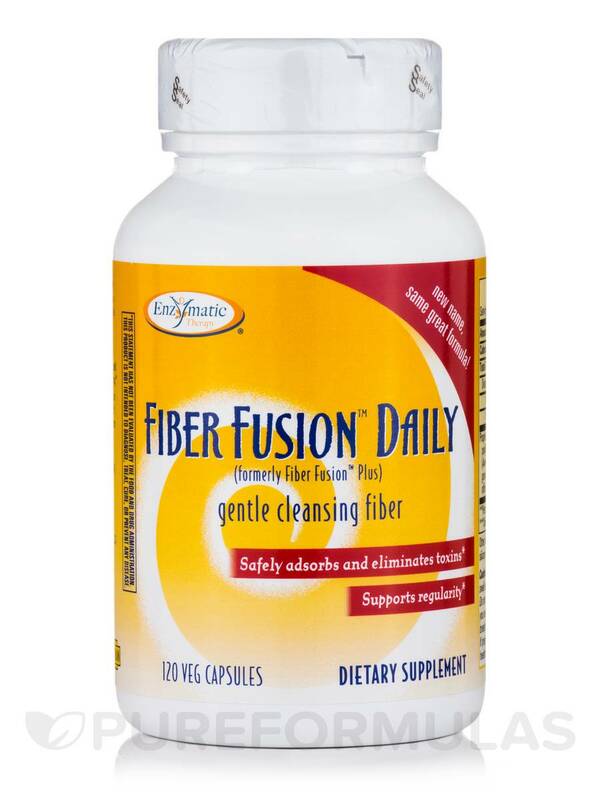 Fiber Fusion Daily by Enzymatic Therapy helps with detoxifying with daily bowel movement. Easy to swallow even though pills taken in divided doses. 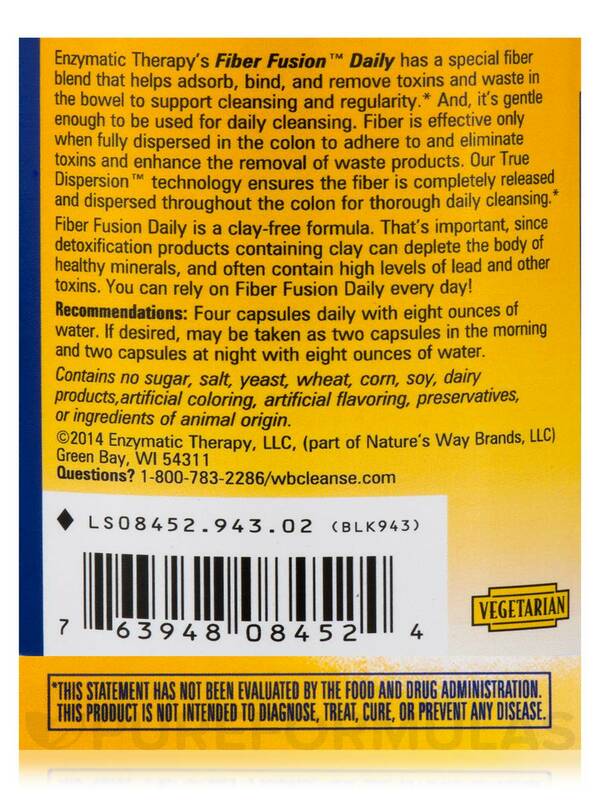 Everything in Fiber Fusion Plus is awesome...even has the highly recommended citrus pectin.